In quick succession, Kyla’s fiancé cheated both her and her grandparents of their savings; she was in a serious car accident which left her broken and scarred; and her grandparents who were forced to leave their home passed away. With the court case behind her and her now ex-fiancé behind bars Kyla’s two closest friends drag her to a dude ranch in Montana to help her regroup and plan her next step. One of the first people she meets in Whisper Creek is Decker, the quintessential tall dark and handsome cowboy. She’s attracted to him but with so much baggage weighing her down she doesn’t trust her judgement. Decker has his own problems. After kicking him out many years earlier, his father used the ranch to back his out of control gambling. Now his father has died and left Decker with the mess. He needs to find the money to pay back the debts or the ranch will be lost. Nothing happens in Accidental Cowgirl that I haven’t seen before, but it’s exactly what I want from this genre. A simple story well told, characters I like and nothing too tricky. It’s a light and satisfying read and among the better Contemporary Romances I’ve read recently. 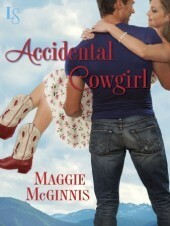 This entry was posted in Uncategorized and tagged contemporary romance, Maggie McGinnis, montana by setaian. Bookmark the permalink.